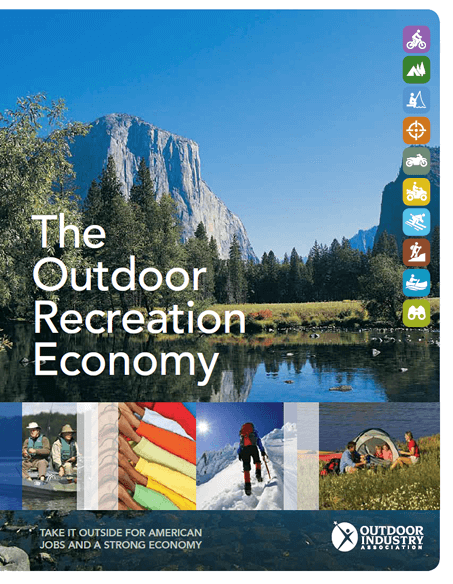 The Outdoor Industry Association just released their 2012 Outdoor Recreation Economy Report. This report detail that status, trend and current state of the outdoor market and its economic impact on the United States. The outdoor industry continues to be an extremely large and sometimes under rated vertical in the US. The size and growth patterns present an enormous opportunity for companies to increase their revenues by garnering a larger share of the consumer spend. With strategic and tactical marketing efforts companies can position themselves to capitalize on the increasing spend for outdoor recreation products, trips and adventures. Below are a few of the main take-aways from the Outdoor Recreation Economy Report. While other sectors are contracting, the Outdoor vertical continues to experience growth and job creation in a tough economy. Many companies have already taken advantage of the market and others are still looking to find the right business and marketing strategy to earn a piece of the pie. From a marketing perspective, the channel is complex and requires expert knowledge to navigate. Versa Marketing Inc. has been providing companies with this expertise and the results have been tangible – increased awareness, sales, website traffic, consumer engagement, etc. As a leading marketing agency we have worked closely with outdoor retailers to expand their online presence and increase sales. Our proven track record of success has generated significant increases for our clients and turned their online marketing channel into an indispensable source of revenue. Our seasoned affiliate managers are all outdoor enthusiasts and know the outdoors vertical inside-and-out. With their extensive campaign management experience and passion for the outdoors, they can turn a retailers online marketing into a long-term, performing revenue source. One of the most value online marketing channels, that is often overlooked, is affiliate marketing. Affiliate marketing is categorized as performance-based marketing because it rewards affiliate partners for customers referred to your website through the placement of banners and contextual ads. Affiliate marketing is positioned to target consumer audiences that are relevant to the product or service your sell. An affiliate program is one of the best direct online marketing campaigns a merchant can launch and will generate a rapid ROI. Affiliate programs must be expertly managed in order to maximize their potential. Our experience has given us the tools and strategies for creating, implementing and developing successful affiliate programs. We have partnered with the top affiliate networks to launch and manage affiliate programs for our Outdoor Industry clients. With our robust affiliate program management we have dramatically increased sales for many of the top online retailers. Here’s to the success of Outdoor Retailers in 2012 and beyond!